The bass of the Louisiana marshes don't see a lot of baits and they're absolute suckers for frog imitations. Typically, anglers planning trips to the heralded marshes of Southern Louisiana envision limits of redfish and speckled trout. There�s no lack of those Southern faves, but push deeper into the brackish-to-freshwater zone and you�ll also find loads of largemouth bass. Tidally influenced and given to gobbling a mix of freshwater and saltwater forage like shrimp and blue crabs, Delta bass are a spunky lot with appetite and attitude to spare. On a past trip to the lower Sabine River marsh, Stephen Johnston � a Texas/Louisiana guide and tournament ace from across the pond � led our group into the labyrinth of canals, cuts and sloughs. Roseau cane, coontail grass, water hyacinth and lily pads dressed a 24/7 food production facility. Johnston described marsh bass as early- or late-bite fish. From our target area on the southwest coast, to the popular Mississippi Delta marshes around Venice, Buras and Delacroix, overcast days, like ours, allow you to fish later because the bass are not so spooky in the low-light conditions. Tides also influence the marsh by nudging interior water levels up and down. �On high tide, you�ll have a lot more searchable water, but on the low tide you have to stay in your main cuts and sloughs,� Johnston warned. 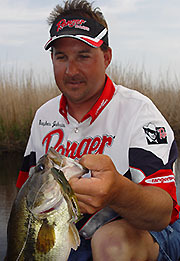 Stephen Johnston, a top tournament angler from Texas who guides on the Sabine River marshes, says anglers should focus on the edges of hydrilla, as that's where the baitfish congregate. Ebb and flow may not appear as dramatic in the marsh as it does on the shores of coastal islands, but the influence is nonetheless noticeable. For this reason, shallow-draft boats with narrow clearance are ideal for the marsh habitat. 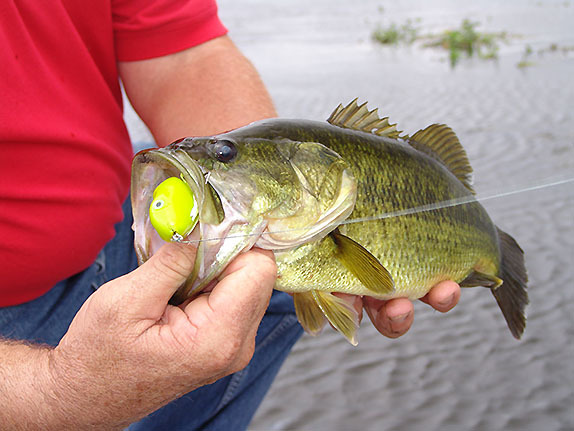 There�s plenty of water that can accommodate a bass boat or a bay boat, but reaching some of the sweet spots will test your resolve. As Johnston points out, water hyacinth can get piled up in the cuts, so your fishing trip may at times resemble an off-road adventure in a 4x4. But the challenge begets the bounty, as relatively low fishing pressure means uneducated fish. �Because it�s a bit of work to get back into those places, a lot of those fish (rarely) see a person,� Johnston said. �But once you get in there, it�s well worth it. A lot of those fish just grow up and die of old age back there. Such fervency delivered the kind of action that thrills the angling heart, but comes really close to spoiling a fisherman. Approximately 30 bass in just a couple of hours was no exaggeration. The total could have ticked higher, but the action inherently slows down when you have a trigger-happy photographer onboard. Johnston opened up the show with a Stanley Ribbit soft plastic toad. In the refuge backwaters, he uses watermelon seed, white and black. The legs do most of the convincing. Toads cast toward the mouths of marsh cuts and run out creeks typically met with immediate demise. Those that weren�t promptly inhaled quickly attracted determined pursuit from bass so driven by aggression that they resembled mini-submarines pushing wakes across the surface as they closed in for the kill. The Sabine National Wildlife Refuge consists of numerous canals running in various directions, and all can be productive. Natural or manmade marsh cuts provide ideal ambush points for bass because wind and tide ushers water through these arteries and delivers food to the waiting predators. You�ll also do well with Texas-rigged worms, poppers and chuggers, and small prop baits like Heddon�s Tiny Torpedo. One of Johnston�s favorite marsh bass-foolers is a 1/8-ounce Beetle Spin. The diminutive body matches the smaller indigenous baitfish of the refuge. Growing in tighter confines than baitfish of open waters, marsh forage tends to lean toward the shorter end of the scale. Whatever the bait size, you�ll find loads of them along a good wall of hydrilla. Often growing in dense fields, this water weed is like a mall food court for bass. �Fish the edge of the hydrilla because that�s where the baitfish congregate,� Johnston said. Also worth a few casts are the various drilling industry structures scattered throughout the marsh. Linked via subsurface pipes, these islands of wood and metal provide feeding/ambush stations and the ever-important shelter. 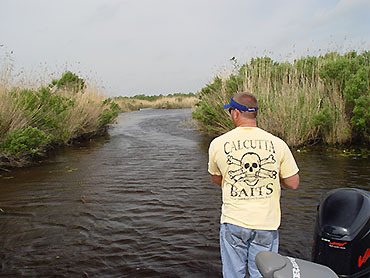 For fishing the brackish backwaters of any marsh environment, Johnston suggests carrying a push pole � as much for scooting through shallow spots when the tide drops as for pushing wind-blown hyacinth out of your path. Also helpful are Power-Poles, or the local favorite � the mud anchor, which holds fast and retrieves easily when speared into the bottom. A piece of rebar with one end bent into an eye and fitted with a rope works just fine. As for a fishing vessel, requirements are minimal for marsh missions in the Sabine National Wildlife Refuge. Numerous waterways running in various directions means you can always find a leeward spot in which to hide from the wind. You can run as far as you like, but the number of fish you catch � or the amount of fun you have � doesn�t necessarily correlate to how much gas you burn.